One of the challenges with new pets is learning to deal with their bathroom habits. Luckily, with rabbits, they are very similar to cats. You can litter train your rabbit and keep their messes confined to an easy to clean litter box. It will take a little work, especially with a young rabbit, but it will be worth it once your rabbit is trained. Just like everything else you buy for your rabbit, you want to make sure you’re using a safe rabbit litter for your pet’s health and safety. 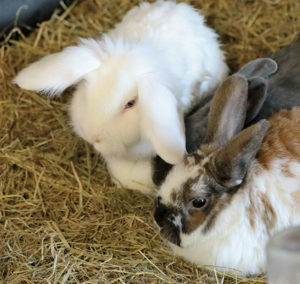 If you’re new to rabbit ownership or already have a messy bun that needs some help, this article covers everything you need to know about rabbit litter and litter training. Like everything that goes in your rabbit’s cage, you want to make sure your litter is safe for your pet bunny. There are certain materials that are toxic or dangerous to rabbits. Rabbits spend a lot of time around their litter, often laying on it or even nibbling on it. To ensure your rabbit stays safe and healthy, you should only use litter options that are safe for bunnies. In addition to safety and health considerations, rabbit urine also has a very strong odor. Because of the offensive aroma, there are certain litter types that work better to absorb and mask the smell of your bunny’s litter box. To help you shop for rabbit supplies and a safe litter for your rabbit, here’s all the do’s and don’ts of rabbit litter. Here are some of the best brands of rabbit litter available. We’ve tried every one of these at one time or another with our pet rabbits and they’re all great options. Each litter has its own pros and con and the type you buy will be based on your own preferences for cost, odor absorption, and availability. 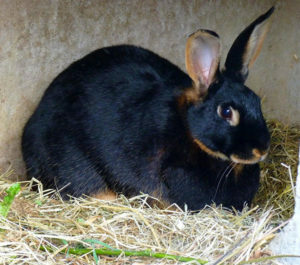 You will notice we do not recommend aspen shavings, even though they are safe for rabbits. 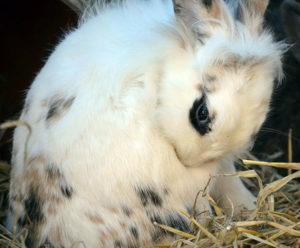 While Aspen shavings are very cheap we find that like when you use shredded newspaper, hay, or straw for your rabbit’s litter that while they are absorbent, they do absolutely nothing for odor. Instead. you have to change the litter frequently and deal with more unpleasant smells. A lot of bunny owners also complain that shavings and shredded paper stick to their rabbit’s fur and get tracked all over the house, which means, even more messes to clean. Our recommendations are better at absorbing odors than these cheaper options. My top recommended litter for rabbits is some form of wood pellets. We’ve used many different brands throughout the years (generally depends on what was on sale when it was time to buy more) and they’re all generally the same. If you live somewhere with access to a feed store you can often buy large quantities of wood stove pellets at a super cheap price and may be able to find them at home improvement stores in the winter. Wood pellets are dust free and very absorbent. When your rabbit urinates, the pellets break down as it absorbs the urine, leaving no liquid behind. It’s easy to sweep up or dump out into a trash bag. In addition to absorbing urine, wood pellets also do a great job of counteracting the odor of your bunny’s urine. As long as you are changing out the litter every few days, you should experience very few unpleasant smells. The Kaytee brand is easy to find at most pet stores or to order online. Available Sizes: 8 lb., 25 lb., 40 lb. If you live in an urban area where you don’t have any options to buy wood stove pellets, you can get the same experience at an affordable price with Feline Pine. This wood pellet litter is sold in the cat section and made with 100% natural pine. It’s also perfectly safe if you’re shopping for a new rabbit litter. Just like other wood pellet litters, it has no dust and fully absorbs urine, eliminating odors. It is then easy to sweep up or dump out. Since cats are so common, you’ll find this litter at pet stores, grocery stories, and places like Target or Wal Mart. You can also order it online. Feline Pine is also more often available in larger quantities than other litters marketed to small pet owners. You may be able to get wood stove pellets for cheaper elsewhere, but this is a great option for urban rabbit owners. Available Sizes: 7 lbs., 14 lbs., 20 lbs., 40 lbs. Carefresh is a brand well known and loved by many exotic pet owners. It’s no surprise that their bedding is one of the most often recommended bunny litters. One of the big downsides with Carefresh is the price, they are usually one of the more expensive litter options. For some rabbit owners, that’s fine, but if you have multiple rabbits that extra cost can add up. Their soft bedding is made from reclaimed pulp, producing a dust free rabbit litter that is perfect for a litter box or an entire cage floor. They advertise it as 99% dust free and 3x more absorbent than wood shavings. From my experience, Carefresh is great at absorbing urine and reducing odors compared to other rabbit litters. I would say it’s about on par with wood pellets and Yesterday’s News (reviewed below). 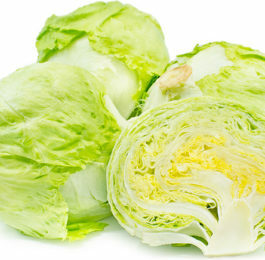 Carefresh is generally only available at pet stores or online, though there are many knock-off or generic versions you may be able to find elsewhere. Make sure you read the packaging to look out for any dyes, perfumes, or other ingredients that are harmful to your pet rabbit. It’s also a great option for households that have multiple types of small pets as this is one of the few litter and bedding options that are safe for multiple types of exotic pets. It’s a great litter for chinchillas, guinea pigs, rats, hamsters, and many other small pets. Note:Whenever buying Carefresh, always buy the “Naturals” version (brown). All other versions are either bleached, contain dyes, or perfumes that can be toxic to your rabbit. Another soft paper bedding option is offered by Oxbow. It’s sometimes harder to find in pet stores, but it is becoming more common. The pricing is usually similar to Carefresh. Made from paper pulp, this is a soft bunny litter that absorbs urine and controls odor easily. The pieces are like tiny soft pieces of cardboard, making it gentle on bunny feet. It’s 99% dust free, making it an easy litter to clean up and it won’t cause respiratory issues for your pet. Oxbow offers a “Natural” and a “Blend” option. Always buy the “Natural” one. This litter works great for other small exotic pets as well. Here’s another bunny litter that we need to go to the cat section to find. If you consider yourself green, then you’ll love this litter even more. Yesterday’s News is quite literal in their name–the pellets are made from recycled paper and they’re compostable. The result is a dark gray paper pellet similar in size to many rabbit food pellets. It is not as soft as Carefresh, but a more affordable paper-based option. This litter is 99.7% dust free and super easy to clean up. It’s great at absorbing odors and easy to sweep up or toss out in the trash. Since Yesterday’s News is marketed at cat owners, you can often find it at grocery stores and places like Target in addition to pet stores and online. It’s usually cheaper than Carefresh or Oxbow, and depending on where you live may be about the same price as wood pellet litter. Cat owners and rabbit owners are similarly smitten with this brand, so it’s a great option if you have both kitties and bunnies. Note: When you are shopping, always make sure to buy the “Unscented” variety. They also sell a “Fresh Scent Version” that has perfumes in it which you should avoid for rabbit use. Available Sizes: 5 lb., 13 lb., 26 lb., 30 lb. A litter box is an important part of your rabbit’s cage. The type you get will depend on the age and size of your rabbit, the number of rabbits you have in a cage, and your rabbit’s personal preference. If you’re a new rabbit owner with a young rabbit that needs litter training, we will cover that in the next section. For now, we’ll just cover the different types of litter pans and recommendations for you to buy. Note: You should avoid any litter pans with a grate that your rabbit sits on instead of sitting directly on the litter. Grates and wire cage bottoms are terrible for rabbit’s sensitive feet and can cause hock sores. As long as you are using one of the safe litters we reviewed above and clean the litter box out frequently, there is no reason your rabbit can’t sit or lie directly in their litter box. In fact, you may discover your rabbit spends a lot of time hanging out in there. A plain, plastic litter pan works great. You don’t need any bells and whistles. Just enough space for your rabbit to get in and do their business. Rabbits instintively go to corners to urinate. While this is usually fine for most litter boxes, some rabbits have a bad habbit of backing their bum up too far when they go. This can result in them peeing outside their box–or even outside of their cage! If your rabbit is giving you headaches with all the messes you have to clean up, then a corner litter pan with a high back will be essential. Kaytee makes a couple versions of this design, which is a compact litter pan that fits perfectly in the corner of any cage or enclosure. This particular model is the tallest they offer. I recommend this one because it really keeps messes inside the litter box, plus it comes with a “quick lock,” which is perfect if you have a rabbit who likes to do occasional “redecorating.” Our rabbit, Barney, had a terrible habit of dumping his litter box out or pushing it out of his cage when he got bored. The quick lock (plus some new tossing toys) helped stop that behavior. These litter boxes are only big enough for one adult rabbit at a time, so you should order one for each rabbit in your cage. Many rabbits like to eat hay while they hang out in their litter box. To help encourage this behavior you can either “hack it” by putting hay in their litter box or hanging a hay rack over it. Or you can buy one of these awesome combo hay feeder and litter box. Handmade by Etsy seller Bunny Rabbit Toys, this pine wood feeder features an easy to clean plastic litter pan encased in rabbit safe wood. 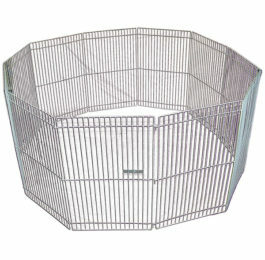 This is a great option for free range rabbits that don’t have cage wires to hang a hay rack on. It also looks a little nicer sitting in the corner of your living room than a normal litter box. The only downside is the price. If you have an elderly or disabled rabbit, they may have difficulty jumping in and out of a normally litter box. Luckily there are some litter pan options on the market known as “easy entry” boxes. They have a side that is lower than the others so they can easily step into the litter box instead of jumping in. The rest of the sides are high enough to keep litter and messes inside. If your pet store doesn’t carry any of these easy entry boxes, a trip to the home improvement store or a garden shop may give you what you need. The litter box pictured to the left is actually sold as a portable potting tray. 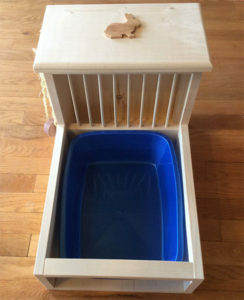 The design is absolutely perfect for an easy entry rabbit litter box. Most elderly or disabled rabbits will be able to use this litter pan easily. You can fill this with any rabbit litter or bedding of your choice and the front lip will keep the litter and poop inside. If your rabbit is a free-range bunny or a particularly messy digger, you may find a covered litter box to work better for you. These are great for living rooms and other public areas of the house as they keep messes and odors contained and look a little nicer for guests. They also keep frisky rabbits from kicking their litter out of the box when they are in the mood to dig. 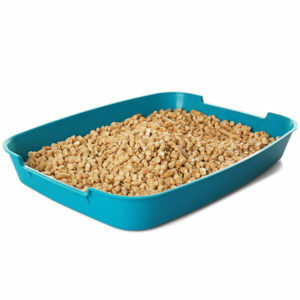 There are many different styles of covered litter boxes available, especially if you check out the cat section of the pet store. The majority are plastic and have a removable lid so you can easily clean out the inside of the litter pan. If you’re willing to spend a little more, they even make litter boxes that look like furniture so that your guests will have no idea what’s inside. Rabbits are fairly easy to litter train and once they’re trained, they will not stray from their habits. Older rabbits are easier to train than young rabbits, but young rabbits usually just take a little extra time. If your rabbit is spayed or neutered it will make the process much easier. 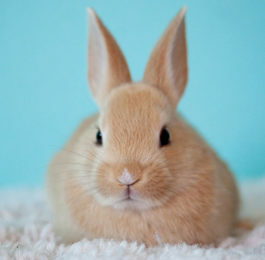 An un-altered rabbit will be less likely to use their litter box because their hormones make them want to “mark their territory.” Because of the health and behavioral benefits that come with spaying and neutering, we recommend getting your pet bunny fixed as soon as they are old enough. In the long run, it will definitely save you many litter training headaches. Before you start the process of litter training your bunny, you need to understand a few things about their behavior. First, is understanding how your rabbit usings droppings or “pills.” You will notice that your rabbit leaves little pills around their cage or play area. This is a territorial behavior that they use to mark their “home.” You will not be able to completely break them of this habit as it is ingrained in them by nature. However, a properly trained rabbit will leave the majority of their pills and only urinate in their litter box. To make sure your rabbit only drops territorial pills in their cage, make sure to respect it as their home. That means you need to stay out of their cage as much as possible (keep food dishes near the doorway so you do not need to reach in very far to refill, do not clean the cage when your rabbit is inside, etc.). You should also avoid grabbing your rabbit and taking them out of the cage or forcibly putting them inside. Instead, they should be able to freely come and go from their cage. When it’s play time, open the door and let them come out as they like. When play time is over, you can put them near the door, but let them hop in themselves. When your rabbit feels that their cage is clearly marked as “theirs” they will keep all pills inside. Limit your rabbit to a reasonably sized area that includes their cage and a bunny-proofed play area. If you give them too much room it will make litter training more difficult. Once they’re training you can increase the size to a whole room or even let them free roam your house. An exercise pen is a great option to create this safe space. Place one litter box in the cage and a couple boxes in the play area. Rabbits like to urinate in corners, so try to place boxes there. If your rabbit seems to prefer a different corner, move their box. Play hay in the box or hang a hay rack over it to make it more enticing. Start just observing the rabbit in their cage. Once they start using that litter box, you can let them into the play area. When you first see your rabbit use the box, immediately praise them and give them a treat. You must be actively watching your rabbit when you let them out to play. If you see them try to urinate in a place other than their litter pan, immediately yell a loud “no.” Try to guide your rabbit back to their litter box. Do not chase them or scare them too much so they don’t view their litter box as a punishment. If your rabbit goes outside their box and you don’t see it happen, sweep up the pills or mop up the urine with a paper towel. Place these in the litter box so they understand that’s what the box is for. Once the rabbit has mastered using the litter boxes in the play space, you can expand to a whole room. Make sure there are conveniently located litter boxes, especially when you expand to other rooms or floors of your house. Take this step very slowly. Do not suddenly open up your whole house to your rabbit. Add one room at a time once each previous one is mastered. Once your rabbit is a litter-trained pro, you can reduce the number of litter boxes in some areas. Try to keep the same routine, your rabbit is habitual and dislikes change. If your rabbit refuses to stop urinating in a certain spot, put a litter box there. This is a fight you may not win since rabbits can be so stubborn. Do not let your bunny play outside their cage without supervision. If you don’t “catch” your bunny in the act of urinating so you can correct them, it will take longer to train them. Don’t give your rabbit free run of your house before training is complete. It will be more difficult for them to learn to use their litter boxes and they may build some bad urination habits that will be hard to over come. Don’t rush your pet rabbit. Litter training takes time and as long as you are willing to put in the time you will end up with a well-behaved bun that will bring you endless joy. Are you a new rabbit owner? We have plenty of articles and guides for rabbit lovers to learn how to take care of their pet bunny. Learn about proper rabbit diet and nutrition and how to find the perfect rabbit cage or enclosure. Learn how to clean a rabbit cage.